Bio is connected with living things or human life. Gas is any substance that is neither a solid nor liquid e.g hydrogen gas etc. Biogas (biological gas) is referred to a mixture of different gases produced by the breakdown of organic matter in the absence of oxygen. Biogas can be produced from raw materials such as agricultural waste, manure, municipal waste, sewage, plant material, green waste, food waste etc. 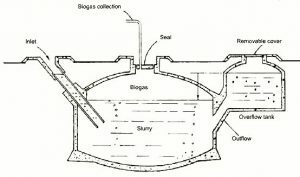 Biogas can be produced by the action of anaerobic organisms which digest materials inside a closed system or fermentation of biodegradable materials. Anaerobic Digestion (AD) is a biochemical process during which complex organic matter is decomposed in absence of oxygen, by various types of anaerobic microorganisms. The process of AD is common to many natural environments such as the marine water sediments, the stomach of ruminants or the peat bogs. In a biogas installation, the result of the AD process is the biogas and the digestate. If the substrate for AD is a homogenous mixture of two or more feedstock types (e.g. animal slurries and organic wastes from food industries), the process is called “co– digestion” and is common to most biogas applications today. Biogas is primarily Methane (CH4) and Carbon dioxide (CO2) and may have small amounts of hydrogen sulfide (H2S), NH3, moisture and other gases in small quantities. Methane can be combusted or oxidized with oxygen. The energy released allows biogas to be used as fuel; it can be used for any heating purposes like cooking. It can also be used in a gas engine to convert the energy in the gas into electricity and heat. 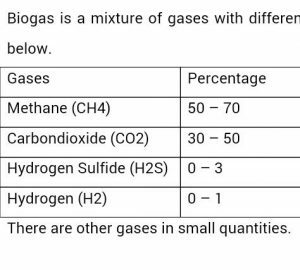 Biogas is a mixture of gases with different proportions. This is presented in the table below. The digester: This is the most important part of a biogas setup. It represents the centerpiece of all the system. From its name, this is where digestion/ fermentation takes place and biogas is produced. The effluent outlet: The opening through which used up organic waste is removed from the system. Biogas outlet: The opening for gas passage. Dedicated energy crops (e.g. maize, miscanthus, sorghum, clover). The digester is the site of transformations of the raw materials which have to be digested. This transformation is carried out by the action of some specific microorganisms that thrive at high temperatures, which produce special substances capable to breakdown the organic materials which are introduced. Biogas is produced in the process. It will take 15 – 21 days before the first batch of gas is produced. Once it starts to produce it will continue producing biogas but you must load the digester daily. Stir regularly the content of the bio digester (stirring can be done daily). Remove plastic and non-degradable materials. Temperature of 30 – 350C is good for good fermentation. The top of your digester must not be covered with trees to allow the sun heat up the digester. For a good fermentation, the pH should be between 6.6 and 7.6. Application of Activated Effective Microorganisms (AEM) help to increase the rate of production. Materials to be digested must be rich in carbon and nitrogen. If the medium is too basic, H2S gas will be produced while in an acidic medium; CO2 is the only gas that will be produced. Not too basic and not too acidic is okay. For Training and Setup of Biodigester for Biogas production at home and on the Farm, contact us on 08034851495, 07086221295 or send us a mail. You can watch more video on our Youtube channel, follow us us on all our social media handles for up to date information.